1. Consist of mill roll stand, preheated roll, Span bridge, single facer, Double facer, NC. Slitter Scorer, cutter-off, Conveyer stacker etc. 2. Hydraulic Shaftless mill roll stands . 3. Finger or fingerless inner vacuum or positive single facer. 5. Intelligent Energy saving System, Steam heating. 9. 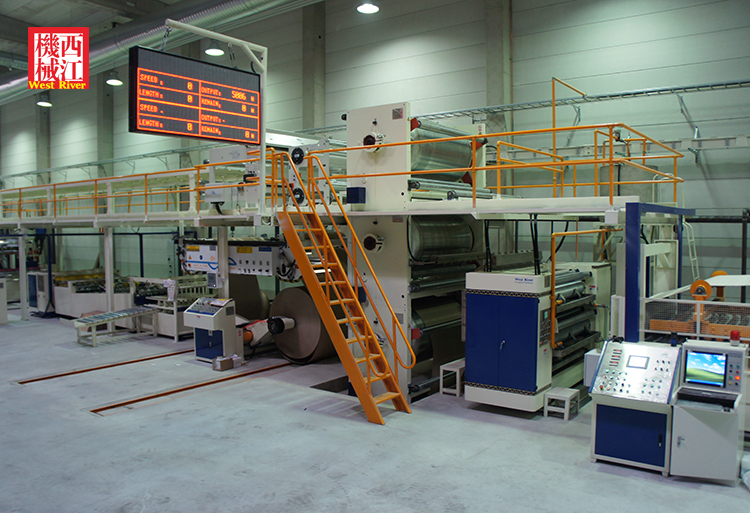 Maximum production speed: 60M/min-300 M/min. 11. Paper roll intelligent storage system and Cardboard discharging and logistics system for option. We have a strong engineer team, and available to serve machiney oversea. A. Yes, we are the professional manufacturer. A. The nearest airport is Guangzhou Baiyun International airport. It take 1.5 hours from Guangzhou to Zhaoqing factory by car. We are glad to pick you up at the airport. A. Talk about requirements, confirm details, sign a sales contract, pay for deposit, arrange production, test machines, buyer pay for the balance payment, arrange shipment. Product/Service (We Sell): Corrugated cardboard production line, Complete Corrugators, Carton Box Machines, Automatic paperboard production line, Remote Control SystemPMS System,Auto Centerized Hydraulic Mill Roll Stand(300-1500),Heavy Roll Paper Trolly,Automatic Splicer,Rotary/Fix Type Pre-Heater,Fix Type Single Facer,Fast Change Type Single Facer,A B C E F Flutes,Cassette Type Single Facer,Steam Type Single Facer,Electric Magnetic Heating Single Facer,Span Bridge,Wind Suction Correction, Automatic Correction and Alignment Divice,EL Automatic Correction and Alignment Divice,Automatic Glue Machines,Servo Control Glue Machines,Smart Glue Machines,Double Facer,Hydraulic Life/Pneumatic Double Facer,Press Roller/Air Bag Double Facer,Elctronic /Smart Temperature Control Double Facer, Shearer,Computer Control(NC)/Machanical Thin Blade Slitter Scorer,Single/Doulbe Layer Guide Bracker,Doule Slitter Scorer,Paper Shedder,Auto Correction Device,UK CT System Control 1/2 Drive Single/Double Cut-off, Single/Doulbe Layer 5 Belt Section Variable Speed Lengthways Conveyor,Single/Doulbe Layer Stacker,Display,3/4 color Printer, Low speed/High speed printer, Slotter, Flat/Rolling Die cutting, Glue machines, Robot arm for Stacking, Auto logistics.